Charles Yee Senior started at home in High School when he was 14 years old in the 1950's. His entire dream was to build custom cars and believes in "Doing it right the first time!" Proud of its 50-year heritage serving the automotive needs of its customers, Yee's Auto Glass & Trim has a wealth of expertise and experience in retro-fitting custom assemblies. Established in 1960 as an automotive repair facility, Yee's Automotive has grown to meet the needs of its customers in three main areas - retail, automotive, and fleet service. 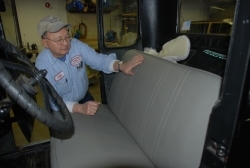 Traditionally their services have included automotive glass replacement, soft trim needs, automotive restoration, and custom component fabrication. Yee's can also provide suspension, engine, and brake updates, as well as, perform electrical and hydraulic repair.